It was the third day of the 2014 General Elk Hunt. I did not hunt that morning, but was preparing to go out during the afternoon and asked, Sonia if she wanted to go. At first she said she had other things to do, but at the last minute, she changed her mind and I’m glad she did. She takes care of her own gear, so the only extra thing I had to do was make sure she had an orange hat and vest to wear even if she wasn’t carrying a gun. Being an optimist, I also asked her to throw her pack frame in the truck. We drove up on our local National Forest, parked the truck and started hiking up an aspen covered hillside at about 9,000 feet. The ridge above is about 400 feet higher and holds large pockets of spruce-fir. The ridge climbs gradually up to a peak at just over 10,000 feet. I chose this area for several reasons, but mainly because we have seen elk and elk sign many times before. There were lots of hunters riding the roads, but I rarely see signs of anyone farther than a few hundred yards off the roads. The entire mountain is circled by roads and there is one road that goes up to the peak, but on the west side where we hunted, there is a road-less area about one mile wide and five miles long. The mountain is very steep on the south side, so if I got an elk, it would have to be packed to the road to the north or the west. The worst case scenario for packing out of this area would be about ¾ mile to a road. I hunted the same area three days earlier by myself and saw a mature bull at sunrise. I was climbing a hillside and first saw his antlers sticking up above the hill at about 60 yards. I watched him (his antlers) for several minutes until he winded me. I only had spike elk and cow elk tags, so I just watched the bull as he trotted up the hill into the trees. 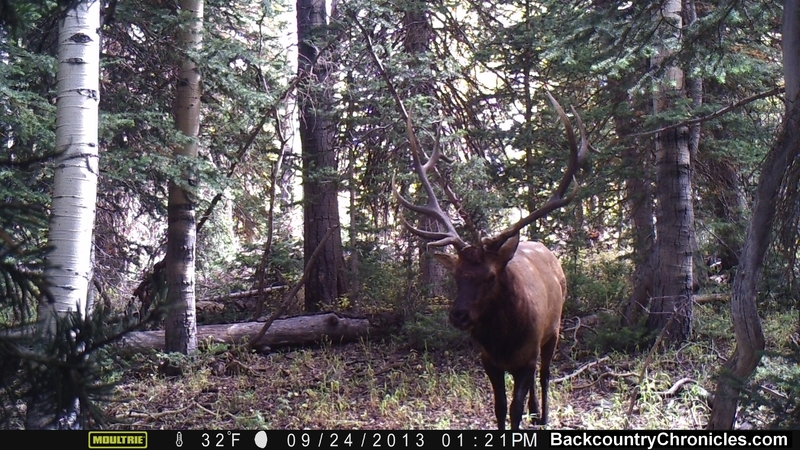 Then he circled back into an opening and stood broadside and watched me at 285 yards. A year earlier while grouse hunting, we saw two spike elk about the same place the day before the rifle season opened in early October. The rut was still going on and as soon as we got out of the truck we could hear the big bulls bugling. The spikes were trying to cross the road to follow the rest of the herd. They both stood and looked at us about 70 yards. 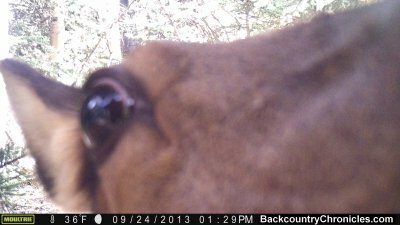 Before last years hunt, we put the trail cam out in the area for several days and again found elk (Photo 1 cow elk above and photo 2 Bull elk here). Three years earlier, during the muzzleloader mule deer hunt, I found elk hiding during the middle of the day on the ridge in the thick spruce-fir cover. The wind was in my favor and I watched them for about 15 minutes before backing out. They never knew I was there. We slowly climbed to the ridge and making sure we were moving into or across the wind. We checked various places we had seen elk or sign. Each site had fresh sign, but no elk. We continued up the ridge towards other areas we had seen elk or sign before. It was a relatively warm day with the temperature in the upper 40s (°F). The wind was blowing very hard at times and then would be very calm for several minutes. Strong wind is good for moving quietly in the woods and it is easy to make sure you are moving in the right direction to keep from being scented, but it’s hard to hear animals moving or vocalizing. We reached the next area we wanted to check and again saw lots of fresh elk sign, but no elk. I decided our next move should be to continue up the north side of the ridge though the thickest tree cover and started to tell Sonia, when she cut me off mid sentence with a “shush!” I heard the cow elk call at the same instance and shut up. At the same moment, the wind died and everything was very quiet. Then I felt a puff of wind on my cheek and it was blowing straight towards the direction we heard the call, so we quickly moved about 100 yards across the wind along the edge of the trees farther away from the elk which I guessed were only 60 – 100 yards from our original position. We listened for about 10 minutes or so, but did not hear any more calls. We slowly started stalking back towards the area we hard the call not knowing if they had caught our scent or not. When the wind would calm down and everything was quiet, we stopped and listened. When the wind blew hard, we moved ahead 10 – 15 yards at a time, me first, then Sonia caught up to me. It is always exciting to be close to elk, especially during the hunting season and when you have a tag in your pocket, it is hard to describe. Because it was during the hunting season, we had to be careful, because of the possibility the call was made by another hunter. I was optimistic because it was a single, faint call. I think most people over use the cow and calf calls, by calling too loud and too often. I had a diaphragm, but decided not to use it. The patchy clumps of conifers, aspen and open areas that were on the top of the ridge turned into a continuous stand of conifers on the north side of the ridge. We continued stalking very slowly into the forest towards the area we heard the call. Over the next hour, we stalked only about 200 yards towards where we thought the elk call originated. We crossed an opening and started down the edge of a line of trees. The forest had opened up and I could see more than 100 yards between trees through several different alleys. As I moved forward, I watched my feet to prevent stepping on twigs and Sonia watched ahead for movement. Then I watched for elk while she crept up behind me. I was moving again and was mid-step when she suddenly whispered “elk!” I looked up but saw nothing for several seconds, and then I saw movement too. If I had taken another step or two, the elk would have seen or heard me and bolted. By paying attention while I was moving, she stopped me in time and I didn’t spook the elk. I looked for the elk through the scope and saw an elk’s rump and body partially hidden by trees. It seemed like minutes, but was probably only a few seconds before the elk took a few steps forward, then disappeared behind a tree. Then it reappeared again and I could see the body, but not the head. I had a spike elk and a cow elk tag, but I wasn’t going to shoot without making sure it was a legal elk. The elk took a few more steps forward and I clearly saw it was a cow, but I had no shot at the vitals. If the elk continued in the same direction, I was going to get a shot. If it turned away, the stalk would continue. I didn’t bother to range the distance because I knew it was between 100 to 120 yards. My scope was sighted in at 200 yards, so at that distance, the cross hairs would be about 1½ inches high. The wind was blowing straight into my face, so no adjustment for windage would be needed. Luckily, the elk continued walking slowly in the same directions and finally stepped out from behind the tree. She stopped broadside, so I aimed at the top of the heart and took the shot. She continued walking slowly for about 20 yards and stopped behind another tree as if nothing had happened. I saw no indication the 160 grain 7 mm Rem. Magnum bullet had hit her at all. I quickly put another round into my Thompson Center pro-hunter, but could not get another shot through the tree. Since the elk was not moving, I waited. When she took a few more steps out of sight, I moved up slowly and found another alley where I could see her through the trees. Her head was hanging low and was shaking. I expected her to stagger and go down any second. It was obvious the elk had still not seen us. I think she was fading and was not aware of anything around her, but she still did not go down. The only shot available was a two inches spot, low in the chest that was visible below the tree limbs. I took that shot for insurance and the elk slowly turned and walked out of sight, again with no indication of a hit. I waited a few minutes and heard or saw nothing. I slowly moved closer but couldn’t see the elk. We waited and listened for about five more minutes, then slowly moved up to the last place I saw her last. There were fresh tracks and scuff marks, but no blood. I asked Sonia to go to the area the elk was standing when I took the first shot to see if she could find blood while I followed the track. She found blood first, so I knew the elk was hit. I couldn’t imagine not hitting her at that distance, but it is always possible for a bullet to hit a tree limb you don’t see. Photo 3. 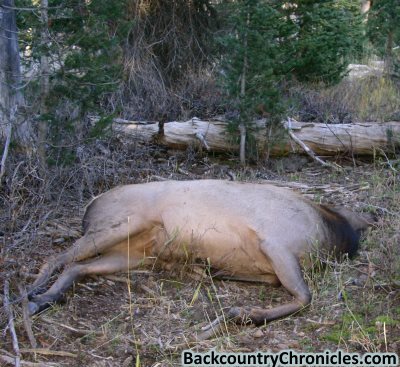 Cow Elk Down after walking 35 yards. When I first saw the cow elk’s head trembling, I thought she was going down, but after she walked away, I wasn’t so sure. After we found blood, I was sure the shaky head was an indication of a good hit. I didn’t have to track her very far. She was down just behind the next tree, only about 15 yards from the last place I saw her and about 35 yards from where I shot her. It is fairly common for elk that are not spooked to stand still or walk slowly after being shot. Later, Sonia told me she had seen at least two elk, but I only saw the one. There are few things more exciting that stalking big game and few things as satisfying as a successful hunt. But when elk hunting, this is when the hard work begins, but this is also the best part of this particular hunt for me because Sonia was there and she prevented me from spooking the elk. I started quartering the elk and Sonia returned to the truck with the GPS to move to the closest point on the road and to retrieve our pack frames. While butchering, I saw that my first shot had hit both lungs, though the shot was a little higher than I intended. The bullet passed straight through without hitting any ribs and the exit hole was as big as my thumb, so the bullet (Barnes Triple-shock X bullet) expanded as advertised. There was a tremendous amount of hemorrhaging inside the body cavity, but very little bleeding outside of the body. I did not find any evidence of my insurance shot, so it must have been a clean miss. Sonia returned about an hour later, just before dark with the pack frames as I was finishing the quartering job. Two game bags held the elk’s hind quarters, which weighed 65 lbs each (hide on, feet cut off). One game bag held an elk shoulder (hide on, foot cut off) and a back strap and weighted 52 lbs. I took the time to skin one of the shoulders so it was lighter, but added additional trimmed meat to that bag along with the other back-strap, so it the last bag weighed 56 lbs. I still had my rifle and we both had our day packs and the four game bags with 238 lbs of meat, bone & hide to pack to the road about ½ mile away. I strapped one hind quarter to my pack frame and the heaviest shoulder to her pack frame. We moved the packs and my rifle about 100 yards towards the truck, then returned to the carcass to move the rest. It was easier to carry the game bags that were attached to the pack frames, but to save time, the other game bags were thrown over our shoulders and we carried our day packs in our hands, until all the meat, packs and rifle were at the next stash site. I didn’t want to get too far away from any portion of the meat or our gear because I have wasted too much time in the past trying to find things in the dark even with GPS. It was very dark in the woods after sunset for about two hours before the moon rose high enough to make some light. During the pack, we had to replace the batteries in both of our headlamps, so always make sure you have plenty of batteries. For future reference, I will carry Glow sticks (chem lights) or flashing fishing bobbers to hang at each stash site to make them easier to find in the dark. We continued to move the “pile” 50 – 100 yards at a time towards the truck. This way, we could rest while we returned for the next load. Sonia was (and still is) dealing with a shoulder injury, so she couldn’t continue to pack the game bag over her shoulder. I packed most of the meat while she carried the day packs and my rifle, but she still carried her pack frame with the elk shoulder on every section of the trip. We made it to the truck with the last load at about midnight, six hours after shooting the elk. I can’t tell you how proud I am of my girl. My only regret is that was too dark to take a picture of her with an elk shoulder sticking out the top of her REI backpack. How cool is that for a city girl from New Jersey? Now, think of all the goods things (like sausage) we can make with all that good meat.